Jim Smith is a true Renaissance man. He is a land artist in the tradition of Andy Goldsworthy, a lighting designer, a creator of unique structures in the land, where people can experience themselves in spaces that are esthetically sensual and inspiring. He calls himself a “spatialist;”…one who creates outdoor spaces that invite wonder and delight. Jim lived for 20 years as a nomad, resourcefully navigating life artfully. Living out of a camper with an enviable free form, low overhead existence, he was able to travel the world. He built the world’s largest voluntary habitat, a cave for Mexican freetail bats called a Chiroptorium, which has been occupied by 400,000 bats. In 1980, Jim received a building arts grant from the NEA to create an Iris Window. He shared his lighting design expertise with a Japanese “living treasure’, at a royal cremation ceremony in Bali, with a juice parlor in Medellin, Columbia, and on Orcas Island in the San Juans. We all deal with change, which is the only constant. The artist Madelin Coit deals with “the environment in flux” as the direct subject of her work. Her multimedia career embraces oil painting, drawings, prints, sculpture, writing, video, performance and neon. Godfrey Reggio / Filmmaker / "Visitors"
Godfrey Reggio is a director of experimental documentary films. He co-founded La Clinica de la Gente, a facility that provided medical care to 12,000 community members in Santa Fe, and La Gente” a community organization in Northern New Mexico’s barrios. Reggio is best known for is Qatsi trilogy, which includes Koyaanisqatsi, Powaqqatsi, and Naqoyqatsi. Soundtracks for his films were composed by his friend Philip Glass. In 2014 Reggio was recognised by the Museum of Arts and Design in New York City with a career retrospective entitled Life with Technology: The Cinema of Godfry Reggio. Presented by Steven Soderbergh in Black and White digital 4K projections, Visitors explores humanity’s trancelike relationship with technology, which, when commandeered by extreme emotion states, produces massive effects far beyond the human species. Judy Tuwaletstiwa is an artist and author of Jewish descent, married to a Hopi Native American. Tuwaletstiwa is a mixed-media painter, sculptor and photographer who uses natural materials such as mud, sticks, feathers, glass and fiber. Her work is influenced by the geography around her. Nancy Judd is an artist and environmental advocate who creates couture fashion sculptures made from trash. Her work is included in the Smithsonian Museum’s permanent collection. Carlos Carulo is a Chilean painter and sculptor, whose work has been called ‘surrealistic,” “chilling” and high-tech.” He moved to Santa Fe in 1974. 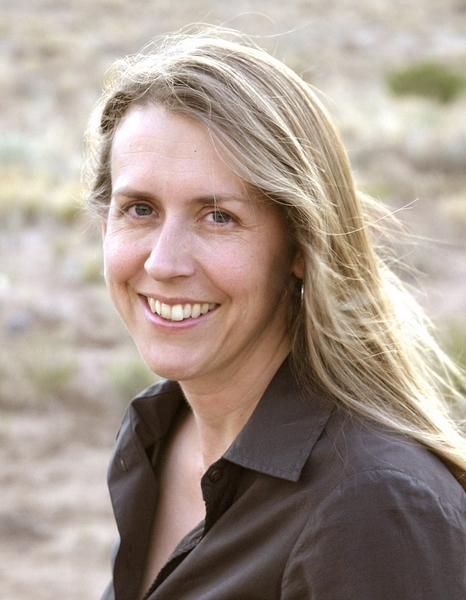 Debra Anderson is the director and producer of "Split Estate", an Emmy-award winning documentary that investigates the oil and natural gas drilling boom called fracking in the Rocky Mountain West and Northeast. Donald Rubin is the founder of MultiPlan, Inc. and co-founded the remarkable Rubin Museum of Art in Manhattan with his wife Shelly. Rubin also developed the Himalayan Art Resource website and he initiated the Labor Arts Project to gather, identify, and display examples of the cultural and artistic history of working people. Lily Yeh / Artist / Visionary / Barefoot Artists, Inc. The art of mosaic is the art of taking something broken and creating something whole. Lily Yeh, with members of the community, created a memorial to the Rwandan genocide. Yeh is an urban visionary who creates collective collaboration. Lily Yeh (born 1941, Guizhou, China) is an artist whose work has taken her to communities throughout the world. She was a professor of painting and art history at University of the Arts (Philadelphia) from 1968 until 1998. As founder and executive director of The Village of Arts and Humanities in North Philadelphia from 1968 to 2004, she helped create a national model in creative place-making and community building through the arts. In 2002, Yeh pursued her work internationally, founding Barefoot Artists, Inc., to bring the transformative power of art to impoverished communities around the globe through participatory, multifaceted projects that foster community empowerment, improve the physical environment, promote economic development and preserve indigenous art and culture. In addition to the United States, she has carried out projects in several other countries. Joe Berlinger / Director / Film: "Crude"
Joe Berlinger is a documentary filmmaker known for his work with Bruce Sinofsky on Bother’s Keeper, Paradise Lost: The Child Murders at Robin Hood Hills and Crude, the film we discuss in the interview. Crude is a 2009 documentary premiered at the Sundance Film Festival, directed and produced by Berlinger. It follows a two-year portion of an ongoing class action lawsuit against the Chevron Corporation in Ecuador. David Lebrun / Filmmaker, "Breaking the Maya Code"
The complex and beautiful hieroglyphic script of the ancient Maya was until recently one of the last great untranslated writing systems. Based on the best-selling book by Michael Coe, called by the New York Times "one of the great stories of 20th century scientific discovery", Breaking the Maya Code traces the epic quest to unlock the secrets of the script across 200 years, nine countries and three continents. Cyril Christo, Marie Wilkinson / Author / Photographer, Book "Lost Africa"
Marie Wilkinson and Cyril Christo work together documenting relationships between indigenous people and the natural world. Their books of photography include Lost Africa: The Eyes of Origin, Walking Thunder: In the Footsteps of the African Elephant and In Predatory Light: In Search of Lions, Tigers and Polar Bears. Maggie Macnab / Author, Book "Decoding Design"
Maggie Macnab is a designer, author and educator. She is a lover of nature, symbols, and the human spirit. She founded Macnab Design in 1981, and her design work has received international recognition for over 30 years. Her book, Decoding Design: Understanding and Using Symbols in Visual Communication, reveals how common symbols and shapes resonate at a gut level and can lend greater meaning to a design.. She talks about how to uncover how philosophy, math and physics influence great design. .
Colleen Kelley is an author, artist, and visionary influenced by the Tao. Kelley has worked on collaborative projects with other artists, musicians, teachers and ecologists, which produced an artful environmental curriculum that is used in schools, churches and family groups around the world. Lynn Stalmaster is the legendary award-winning casting director of Harold and Maude, Being There, The Thomas Crown Affair, and The Untouchables. Judy Chicago / Artist / "Chicago on Glass"
In this episode of Living Juicy! Judy Chicago speaks about her 2006 exhibition, “Chicago on Glass," at the LewAllen Contemporary gallery in Santa Fe, NM.